Available in an endless combination of possibilities. Remember we can design any of these styles in any length you desire. Sophistication and Fashion meet in this beautiful beaded chain necklace. You can wear the chain with the bumpy textured side of the coin facing out or flip it on the other way and show off the smooth shiny side. 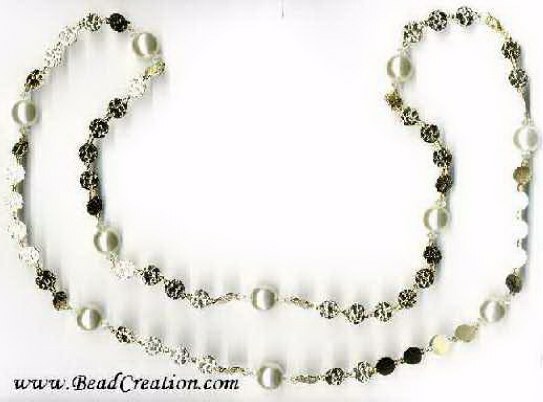 Off white pearls are a featured part of this necklace. Beautiful silver chain with exquisite two sided beads. One side has shiny mirrored glass with ultimate reflective qualities that sparkle. Second side is painted with a shiny silver. This set just twinkles and dazzles brilliantly. The beaded chain necklace is adjustable for the perfect fit. Stunning alone or pair it with a few other necklaces for a great layered necklace look. Only two of this set will ever be made. Simple enough to go with everything, a brilliant shine that gets noticed, & a classic design that will never go out of style. NEW LINE OF BeadCreation BEADED CHAIN CHOKERS, NECKLACES AND BEADED NECKLACE DESIGNS COMING VERY SOON!! !